Baseball people are talking a lot about Maple Ridge’s Tyler O’Neill. Fantasy Baseball websites tag him as a prospect to watch, and baseball writers say he could be trade bait for a Seattle Mariner’s team looking to load up for a run at a World Series. They also predict he could be with the triple A Tacoma Rainiers this year, and even appear in the MLB club’s lineup. There’s buzz because through 63 games O’Neill has been among the league leaders in most offensive categories with the Jackson Generals of the double A Southern League. He is hitting .321 through his first 246 at-bats this year, with 12 home runs and 54 RBI. He also has 18 doubles, and a pair of triples, which gives him a lofty .557 slugging percentage. His on base percentage is a leadoff worthy .384. Virtually every game he’s on the base paths – 59 out of the 63. And throw in four steals to show pitchers can’t ignore him at first. Last year, he finished the year with 16 swipes. The average age in the Southern league is 24, while O’Neill turns 21 later this month, making him also one of the youngest players in the league. At 5’11” and 210 pounds, he was nicknamed ‘Tank’ back when he played with the Langley Blaze in the B.C. Premier Baseball League, and that’s the description most baseball writers still use in describing his physique. “I think it’s a big credit to the new Mariners regime, our new player development director Andy McKay and our new field coordinator Mike Micucci,” O’Neill said in an interview with MiLB.com. On June 8, against the Pensacola Blue Wahoos, O’Neill went three-for-four with a double, a homer and eight RBI. The great night ended with a walk-off grand slam. The RBI record for the league is nine, set by Jose Canseco and four other players. Generals broadcaster Brandon Liebhaber recently talked about O’Neill in an interview for the sports website SB Nation. “What has really stood out this year is his ability to make adjustments and show that he is not just a power hitter,” Liebhaber said. “Obviously, that is his loudest tool, but to see him almost halfway through the season with almost as many walks as he had all of last year is impressive. For a 20-year-old to make the jump from the California League to the much less hitter-friendly Southern League and put up better numbers in many respects has been awesome to watch. 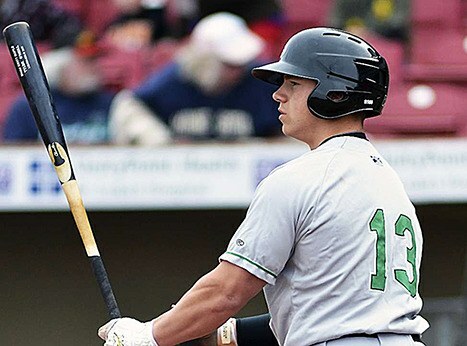 O’Neill was the Mariners’ third round draft pick in 2013. He broke his hand and missed much of his full-season pro debut in 2014, then broke out last season with the Bakersfield Blaze of the California league. He hit .260 with 32 home runs and 87 RBI in 106 games.